I love Christmas, the decorating, luscious food, time with family and friends. 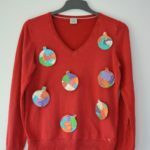 I can be a bit of a bah humbug about things such as Christmas Jumpers, viewing them as a waste of money… That’s where the homemade ugly Christmas sweater ideas come in. 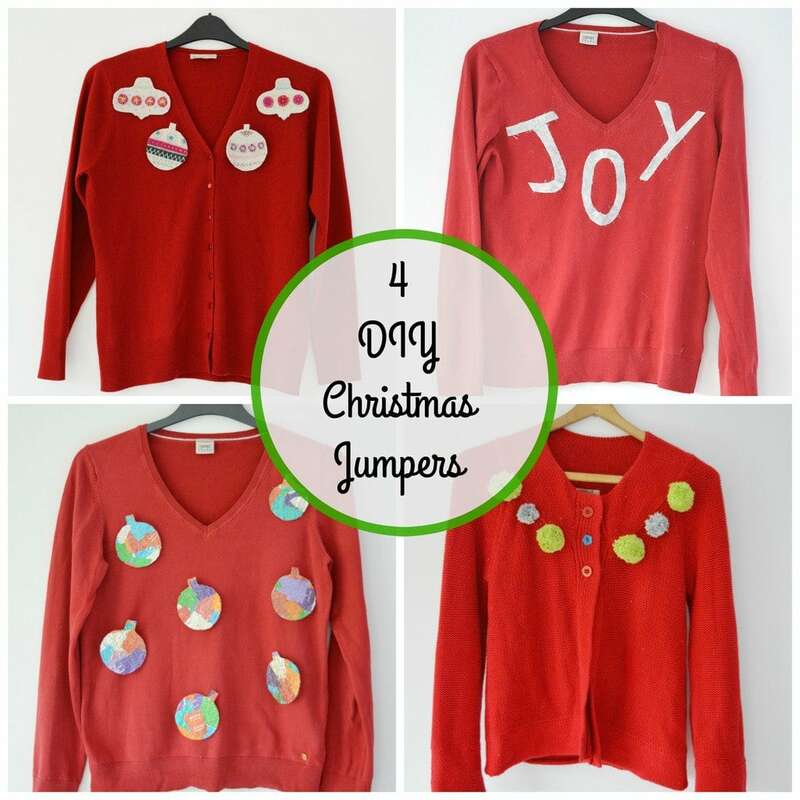 It’s time to recycle an old sweater with these DIY Christmas Jumper Ideas. 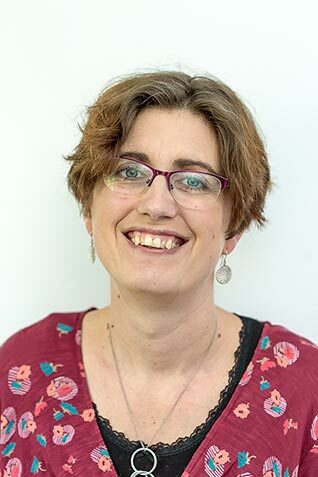 It’s shocking to learn that 300 million (in the UK alone) is likely to be spent on an item that will be worn once this season!! How nuts is that??? 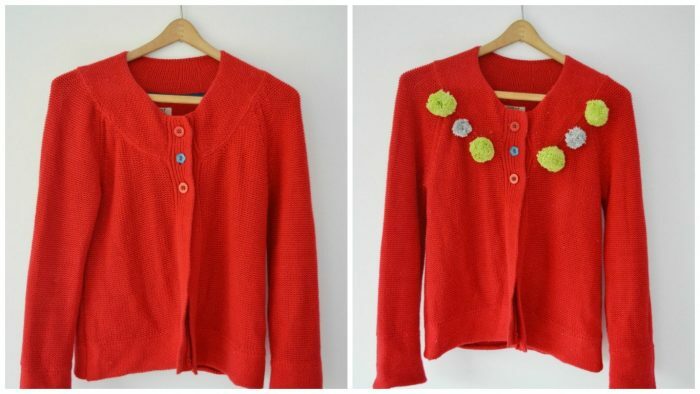 Why not alter a sweater from your wardrobe or second hand, with adornments being either washable or removable. Simple pom poms made with glittery wool – I used a clover pompom maker and managed to persuade my daughter the pompoms belonged to me. She has her beady eye on them!! Keep the yarn tails long and sew these threw to the wrong side of the sweater to secure. 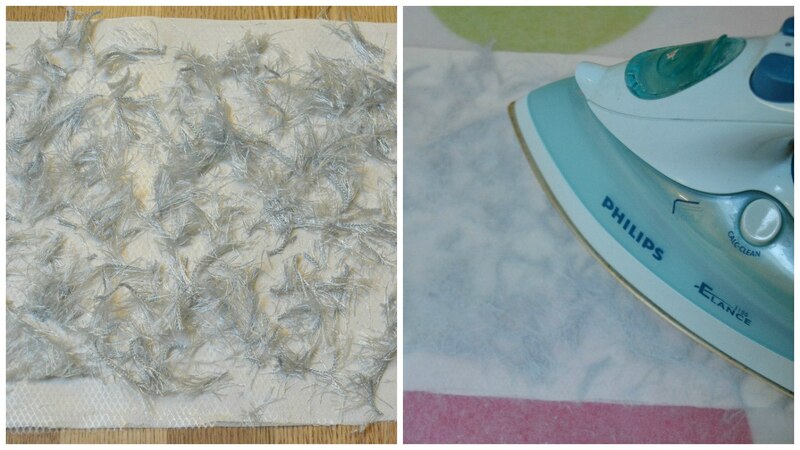 If it’s loose weave sweater I suspect you will be able to unpick leaving no marks once the season is over. My work place is generally full of food, its the worse place to be n a diet, so finding sweet wrappers for this ideas was no issue! 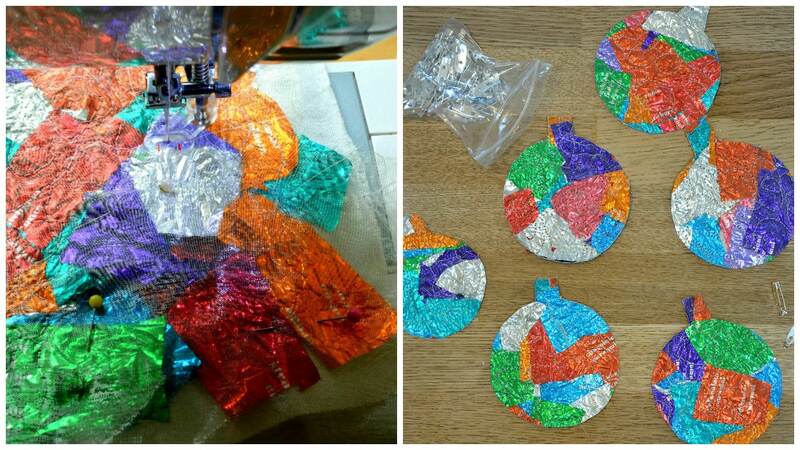 These bauble brooches are made with sweet wrappers. Pieces of sweet wrapper are layered on fabric, machine embroidered, cut out (use a cup for circles stencil) and add a brooch pin on the back (a glue gun is great for this). 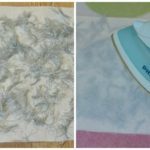 Visit So Sew Easy for a tutorial on the machine embroidery. Ever shrunk a jumper in the wash by accident? 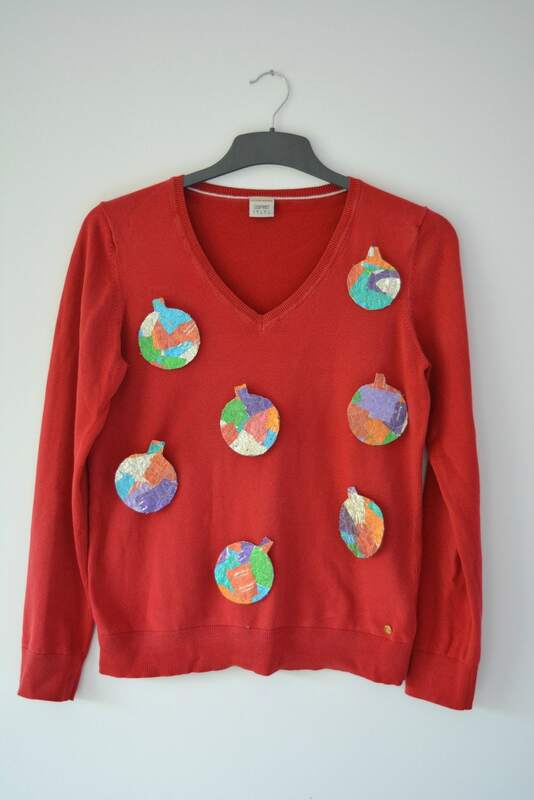 Use the sweater to create felt baubles. Firstly iron on fusible interfacing to the back of the felt. Cut out your bauble shape. 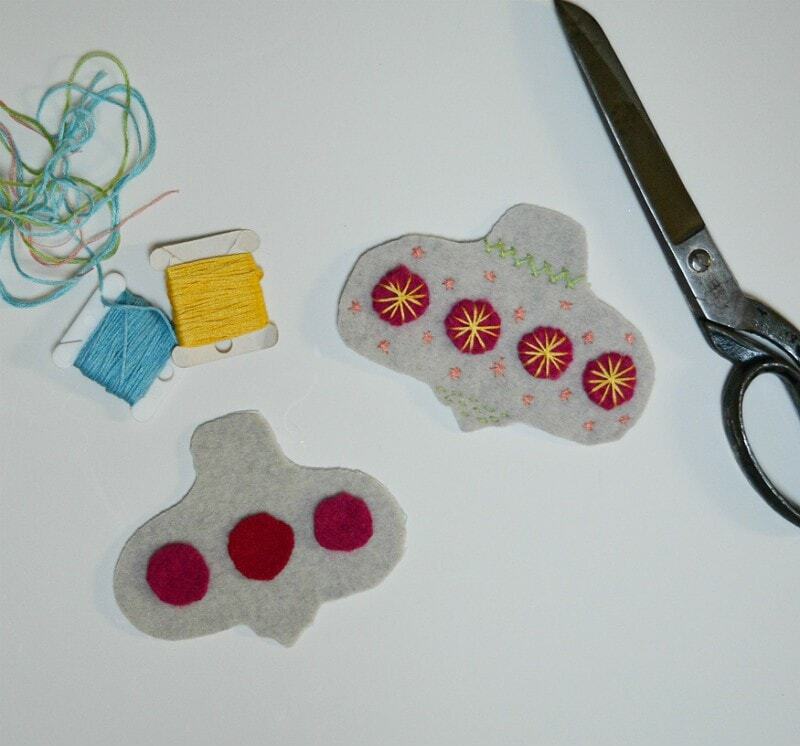 Cut out different coloured felt and place on the bauble. Have fun with a variety of stitches and colours to decorate your bauble. Not confident about hand embroidery? There is a variety of stitched with instructions here. Lastly, sew a brooch pin onto the back. 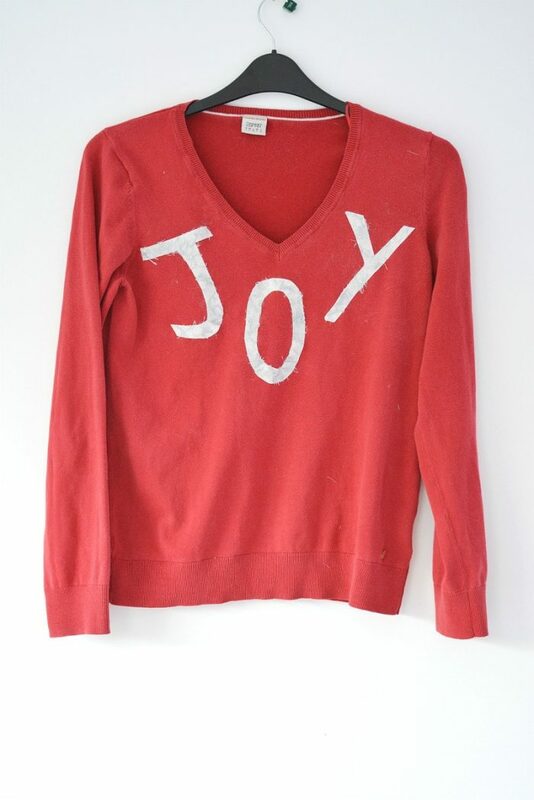 The letters are created with a base of fabric, adding sparkly yarn to give the Christmas feel. Iron on fusible interfacing onto the back of the base fabric. Place bondaweb on the top, shred glittery threads over the top, place your paper (which came with the bondaweb) over the top and iron. This melts the glue in the bondaweb and adheres the threads to the silk. 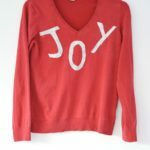 Cut out your letter, using bondaweb for a second time adhere the letters to the jumper, don’t forget to use the backing paper of the bondaweb between the sweater and your iron to prevent sticky residue on your iron. Which is your favourite? 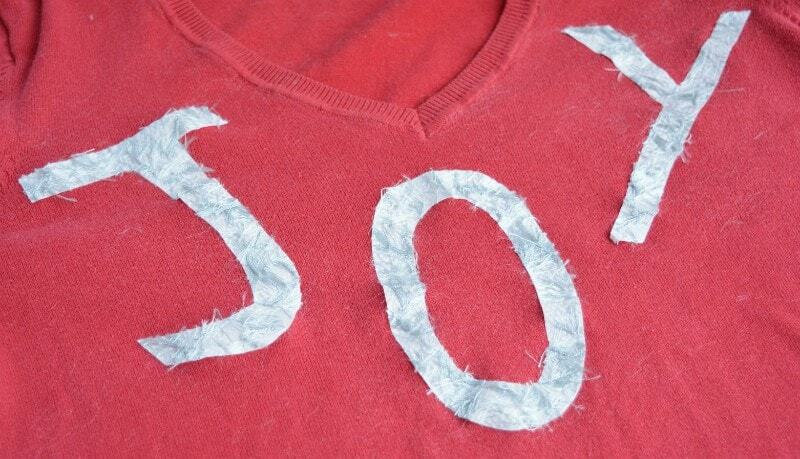 Do you wear homemade ugly Christmas sweaters? I love the embroidered ornaments! They’re my favorite!! Have to admit when I wore the pompom jumper I did seem to spread sparkle as I walked!